“An attempt will be made in this book to enlighten anyone that will listen that there was a time when it did not matter to the troops what their Serial No. prefix was (RA, US, NG, or ER); they were in this to finish the mission that was before them,” Donald Bartling says. He was inducted into the U.S. Army in the 1950s and served in the U.S., Japan and Korea. 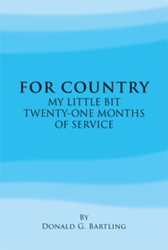 “For Country” (published by Xlibris in January of 2015) details Bartling’s 21 months of military service from induction to discharge. It is a look into what army life was like in that time period. Bartling’s experiences taught him many things like how one can be a good soldier and a good Christian as well. He has many more such insights as he looks back into his experiences that range from his values and beliefs as well as his view on the country’s current issues. I also have come to realize that the real test of a person’s character is determined by the beliefs and actions of the person. Ethnicity, nationality, race, or religion does not determine the quality of the person. I have come to realize that there are both “good” and “bad” in all of the foregoing categories. This was brought to my attention when my platoon contained a varied assortment of all of the categories, and we worked in harmony with each other. Through the publication of “For Country,” Bartling would like readers to have a renewed interest in the importance of appreciating the history of their country and realize that love of country and the Judeo-Christianity are what made their country what it is. Donald Bartling was a farmer at the time that he was inducted into the U.S. Army. After being discharged, he went back to his farm and also served in public positions in the Government Natural Resources District. He served on boards of farm related businesses. Bartling is also active in church administrations.